Bridlington is one of the oldest lifeboat stations in the British Isles. There has been a lifeboat here since 1805, nineteen years before the Royal National Lifeboat Institution was formed in 1824. The first lifeboat house was built in 1806, on the corner of Chapel Street and the Promenade but in 1864 it was replaced by a new building erected at the corner of South Cliff and Windsor Crescent. The present lifeboat house was completed in 1903 at a cost of £1000. 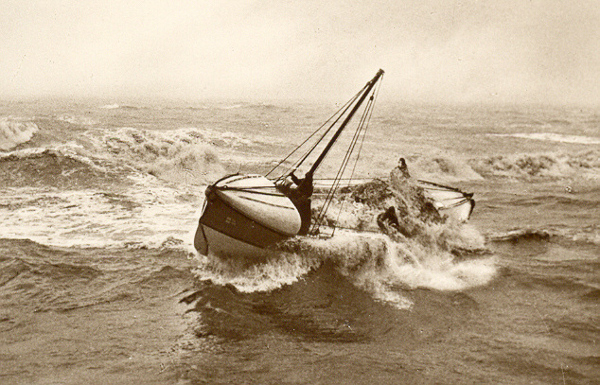 On the 10th February 1871 a fearful gale struck Bridlington Bay and the lifeboat, Robert Whitworth saved the crews of three wrecked vessels, sixteen men in total. 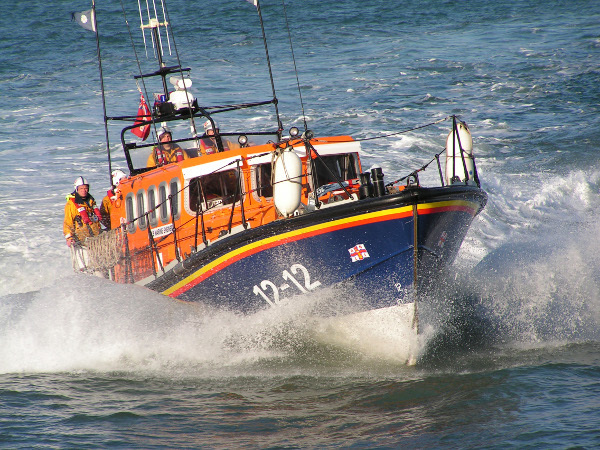 A smaller Bridlington lifeboat, Harbinger, was also launched to save crews from many other ships wrecked in the storm but on her sixth trip she was overwhelmed by wind and waves and capsized with the loss of six of her crew. In February each year a memorial service is held at the Bridlington Priory in memory of the six lifeboatmen, and over seventy lives that were lost from more than thirty ships wrecked in Bridlington Bay on that day in 1871. Because the harbour is tidal, lifeboats cannot be permanently moored afloat and have always been launched from carriages which used to be pulled along the sands until opposite the distressed vessel. The early carriages were drawn by horses but in 1921 they were replaced by a tractor which speeded up launch times. A beach launch is always an impressive site, even on a calm summer’s day, but one cannot fail to admire the skill and courage of the lifeboat men when the lifeboat sets out from the sands through the rough surf of a winter’s gale. In May1931 the Stanhope Smart, Bridlington’s first motor lifeboat, came on station. The change from oars to engine cut the crew size from thirteen to just seven. The first of the new fast Mersey class craft, the Peggy and Alex Caird, arrived in November 1988 and was the first carriage-launch lifeboat to move away from the conventional lifeboat design. She was later replaced by the present Mersey class lifeboat, the Marine Engineer. This twelve metre long vessel, made from Fibre Reinforced Composite and weighing fourteen tonnes, has a range of 140 nautical miles at a speed of sixteen knots but will be replaced in 2017 by one of the latest Shannon class carriage-launched lifeboats. 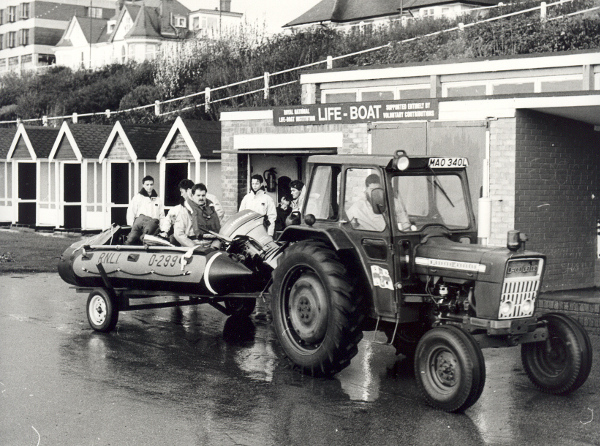 You may also see in action one of the fast inshore lifeboats introduced into the RNLI fleet in 1966. Its boathouse is situated on the south foreshore on Princess Mary Promenade and only twenty feet from the beach which enables it to be launched very quickly in an emergency. The present inshore vessel, Windsor Spirit, has a length of 4.95 metres, a crew of three and a top speed of twenty knots. Part of this boathouse is also a small souvenir shop. RNLI lifeguards were first introduced onto the Bridlington North and South beaches in 2009 and plans are in hand to combine all the offshore, inshore lifeboats and the lifeguards into one new lifeboat house on the South Promenade near the Spa which will come into use in 2016 shortly before the arrival of the new state of the art Shannon Class offshore lifeboat. Until then you will find the main lifeboat house on South Marine Drive opposite the Spa Royal Hall, just south of the Harbour and are most welcome to look round. Here you will see information boards, photographs and a small souvenir shop, as well as a viewing platform to inspect the vessel.